New crossovers, a new esports scene, and a new lease of life for old heroes. It’s strange to think that Heroes of the Storm celebrated its first birthday in 2016 and is only about 18 months old as the clocks tick over to 2017. In the past year, a total of 15 new heroes have been released, the previous world champions Cloud 9 have completely disbanded, a new world champion has been crowned, and much more. It’s not just new heroes: some, like Tychus, received complete reworks and redesigns, updating their kits to be on par with other heroes. A long time ago, Tychus was almost a completely different character, who had a more realistic minigun that had a windup time. It was clunky, inefficient, and not too fun to play. Along came his rework, and he’s now one of the more popular heroes in the game. The same goes for Valla, Malfurion, Diablo, and Artanis, but the list goes on even further. In fact, that’s been a major part of Heroes of the Storm’s 2016: take the foundations laid in 2015, and make it better. In some ways, they did that at a base level. For example, they decreased the speed of heroes while mounted a few months ago, to combat an online meta that focused on group rotations for maximum safety and experience. If that sounded like a lot of jargon: that’s the point. Blizzard didn’t want understanding it to be an essential part of a successful strategy. Heroes of the Storm also got a new trailer to bring new fans in, a new Hero Brawl mode akin to Hearthstone’s Tavern Brawl, and its first crossovers with Overwatch. That’s not to say Blizzard have been perfect at all, mind, especially not on the bug or balancing front. In April, Blizzard had to take the desperate measure of disabling Kael’thas. Kael’thas has often been Blizzard’s nightmare, a dominant spellcaster who is hard to balance without making him too weak or too strong. But here, they managed to do something absurd by accident. One of his abilities is Living Bomb: he damages an enemy, and causes them to explode with damage a few seconds later, that explosion spreading the Living Bomb to nearby enemy heroes. His passive allows him to cast it once for free, without a cooldown. If he died with his passive, on cooldown, though, Living Bomb would permanently have no cooldown or cost. Similarly, and in a more controversial setting, Samuro had a pretty major bug. He can create two illusions as one of his abilities, and one of his heroic choices allows him to directly control them. If you picked that ultimate, though, there was a hidden mechanic: pressing alt + R caused your illusion's health to refresh. This was brought to light by pro team HydraPony, where they used the tactic in a competitive match against Damascus Boys. Below, you can see it in action: watch the two illusions (with red health bars) towards the left hand side of the screen. It wasn’t officially known before this point and so there were no repercussions for HydraPony, as no-one could be completely sure if this was an intended feature of Samuro’s complex kit. Just to be sure, he was banned for further games. Damascus Boys lost that game in the end, but won the series 2-1. As a whole, though, Heroes of the Storm’s competitive scene showed off some of the best sides to the game, and improved greatly over the course of 2016. 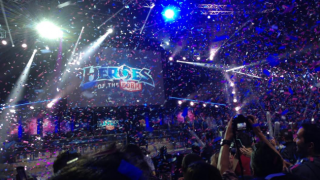 Heroes of the Dorm, for example, came back for a second year, offering college students a chance to win up to $75,000 in scholarships for college. Last year’s winners, Cal Berkeley, came into this year’s tournament with a completely new team and high hopes, which were shattered in the quarterfinals by UConn. In comparison, the runners up from last year, Arizona State, had a point to prove, coming into 2016 with an almost identical team. They came first, without losing a single game in the tournament. In Heroes of the Storm’s Global Championship, it was an open field. As Cloud 9 had disbanded earlier in the year, many teams saw BlizzCon as their time to shine. Both major teams such as Team Dignitas and MVP Black and underdogs like Please Buff Arthas put in good showings. We recapped BlizzCon at the time, but considering how well it lived up to expectations after a year of esports for Heroes of the Storm, it’s worth looking at the best moments—particularly the one above from Fnatic vs. Ballistix. Up until the semifinals of the Heroes of the Storm Fall Global Championship, South Korea had been ruthlessly dominant. That is until the two European teams of Fnatic and Team Dignitas put their foot down. MVP Black were knocked out by Fnatic, going 3-1 in a best of 5, and although they lost to Ballistix in the final, they went out in style. Many of the best moments for Heroes of the Storm’s competitive scene came out of fan-run events, too. Bloodlust held an open qualifier for US teams in September, with the final tournament having over an $11,000 prize pool. Heroes Lounge, in comparison, is a fan-run league for amateur teams of all ranks, and season 2 is currently well under way. Heroes of the Storm has grown greatly over 2016, and it’s good to see the community banding together in positive ways. Despite the sore news for many fans just earlier this month that Dustin Browder, Heroes of the Storm’s game director, would be moving away from the game onto a mysterious new project, things are looking promising under new game director Alan Dabiri. Dabiri has been responsible for the new Heroes Brawl mode, and, according to an interview with Polygon, has a tournament draft mode, plus observer support for drafting in the works. Heroes of the Storm is moving into 2017 with a new face at the helm, a new esports system in the works, and much of the oldest content revamped. Despite the hiccups along the way, 2016 has been a good year for the game, and hopefully 2017 will be better. Or, if there are going to be more bugs, hopefully they’re still funny.